Through our partnership with All Aboard Watersports we’ve been providing an exciting and unique experience for some of Bristol’s care home residents. 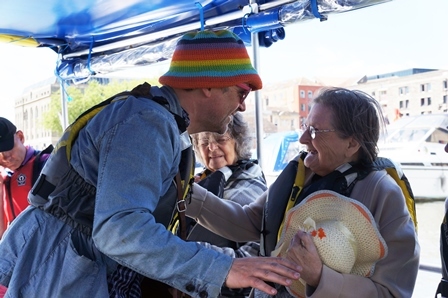 Alive ‘Floating Memories’ sessions enable older people to get out on the water to take in the sights of Bristol’s harbour, whilst learning about some of its fascinating history and sharing their memories of the area. The sessions were provided for free as part of the Come on Board project, funded by Bristol Ageing Better. Taking place on a fully accessible boat with a front ramp meant the trips were accessible for all, including those in wheelchairs. Each trip around the harbour lasted 45 minutes to an hour, with time for a cup of tea afterwards. Alive facilitators accompanied the residents and talked with them about local history around the harbour and played music to add to the experience. Sea shanties have been a huge hit, with residents enjoying singing ‘Haul Away for Rosie’ and making up their own verses. Bristol’s harbour is full of unique history, including the S.S. Great Britain, the old shipyards and steam cranes. Residents saw all this from the boat and discussed the history behind it. One Floating Memories trip coincided with the Bristol Harbour Festival, meaning there were hundreds of boats on the water, which was an amazing experience. Highlights of other trips included getting up close to a £75m super yacht and watching peregrine falcons swoop over the water! The sessions weren’t just about the history of Bristol, they also provided a wonderful opportunity for residents to reminisce. One gentleman told us how he had seen the S. S. Great Britain being towed back into the harbour in 1970 and he remembered how broken it was. Another resident shared how they used to work in transportation, and so recognised so many buildings and places from the water. Activities like these help to connect older people in care to the wider community and gives them an opportunity to explore the city they live in. It also shows just what breadth of activities can be possible for care home residents. The Come on Board Project runs until the end of 2019 and during that time we will be taking many more older people out onto the water.